There are a lot of Wurth HHS products but I believe there is just one that is HHS2000. It is also called HHS 2K in the USA as it had to be reclassified for some EPA reasons but I read it is the same product. There was one other rider that posted in a thread he that was at about 54,000 miles on his chain and seemed to do roughly what I do. iirc he is using a teflon product though so while I don't have any experience with using that it may be that what really matters is the frequency of using the lube. I especially like the Wurth because of its salt resistance as I am often riding on roads that hare been salted or brined and often my chain (and whole bike) is covered with the stuff. No I only ever used Tourance. Regular and Next. As I mentioned previously when I get something I like I tend to stick with it. There is such a law. Thing is there's also a very open and subjective law that gives power to take you off the road. Btw, they are working on the winter tire law to exclude motorcycles. 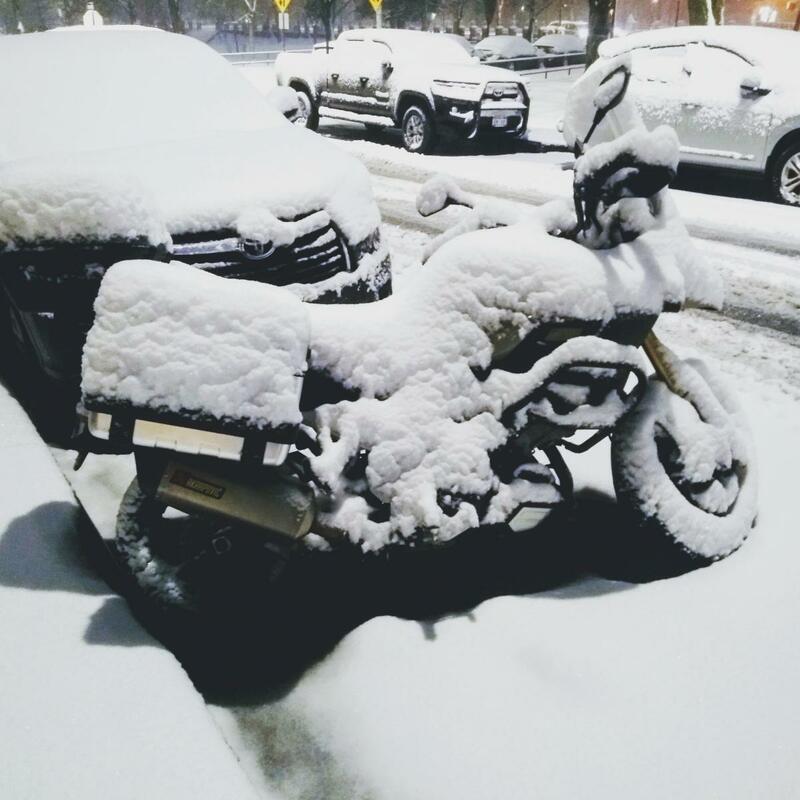 My point was that my understanding is that it isn't illegal to ride a motorcycle in Quebec in winter. It's illegal for residents to operate a passenger vehicle in Quebec that isn't equipped with winter tires. Oh i understood your point. Like i said, there's a lesser known law that allows the officer to invalidate the winter tire law in some cases. Inspirational, Tom!! Great to see that many miles accumulating on one bike. I hope to some day reach the point where I have enough time to ride like that. I pick up my Strom this coming weekend and will use the Wurth product and follow this regimen. I have to purchase it online and when I was looking around for it also found it now has ANOTHER new name, HHS-Plus. I think it has to do with even more EPA regs but at the state level, not federal. ...... Filter is done with every other oil Change. I run factory filters and Rotella 5w40. Have read where others also follow changing the filter every OTHER oil change. What is the reason for that? It seems to me changing the filter every time the oil is changed is very cheap insurance on keeping the oil clean, contaminants from getting through a used filter and insuring oil pressure stays good (less crap blocking the filter media). I change filters every time I change the oil in my cages as well. On my DL650's the manual said change filter every Third oil change. I'd have to look what my DL1000 says. btw The filters actually become more effective until they plug up completely.